Rainfall has occurred over coastal Tamil Nadu and over south Tamil Nadu and Lakshadweep during the last 24 hours ending Wednesday morning. 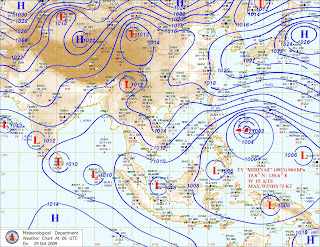 This is seen as a build-up to the northeast monsoon. The easterly and northeasterly winds over Bay of Bengal and peninsular India would now gather further strength over the next few days. The international model,NCEP, says that heavy rains would be confined largely to coastal Tamil Nadu between October 28 and November 4. But after November 5 the rains will penetrate into interior Tamil Nadu and adjoining Kerala. Again, the NCEP and Albany/Roundy model holds on to the possibility of a storm in the Bay in the first week of November. The 30-day Southern Oscillation Index (SOI), now at minus 12, was at its lowest value since 2007. A consistently negative SOI points to the development of some convective activity along the south Andaman/Indonesian sea.and drought-producing "down south." Ocean surface temperatures in the central equatorial Pacific have warmed further and now exceed levels typical of an El Nino event by their greatest margin of the year, Australia's weather bureau said on Wednesday. "Climate models suggest tropical ocean temperatures will remain above El Nino thresholds until at least early 2010," said the Australian Bureau of Meterology. Meanwhile, in the North, nights are getting cooler, and starting from the Northern regions of India, the cool "tongue" can be seen sinking southwards into the central regions. Lows of 11c are observed in Punjab and west M.P.regions. The all India low is as usual in Ladakh at -17c. In H.P, it was 0c in Kalpa. Another approaching W.D. is expected to precipitate some rain/snow in the Himalayan foothills in the next 2 days, and notch up the night readings by a few degrees. Later, in the first week of November, cold will dig into the plains of the Northern sub-continent areas.